View samples of music therapy goals for the special education setting. Music therapy goals for a student’s Individualized Education Program (IEP) support skill development in areas such as communication, academic learning, daily living skills, motor functioning, social skills, behavior, and mental health. These are common goal areas of students with diagnoses such as autism, neurologic impairments, orthopedic impairments, and other disabilities.Just like other goals for individuals receiving special education services, goals supported by a Board Certified Music Therapist should be Specific, Measurable, Action-Oriented, Realistic, and Time-Limited (learn more about writing S.M.A.R.T. IEP goals at Wrightslaw). When music therapy is provided as a related service as part of a student’s IEP, the music therapist is a collaborative and integrative part of the IEP team. After the primary assessments have been conducted in areas such as speech and language, motor skills, literacy, and math, the IEP team comes together to determine the specific educational goals that should be developed to meet these needs. Subsequently, the team decides which members of the IEP team should support these goals. 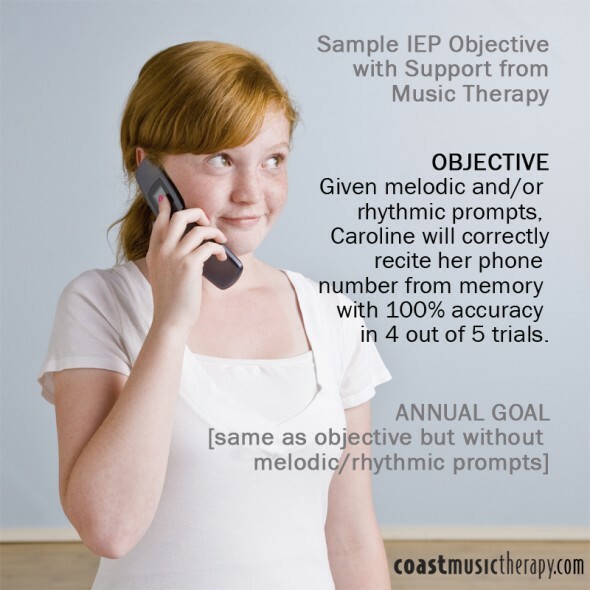 This is typically the point at which the music therapist can provide information from their assessment in order to confer with the team on which IEP goals can be functionally supported through music therapy interventions. Research and evidence-based practice should always be considered when selecting the goals the music therapist will support. For example, if assessment determines that the student has difficult with rote memorization and recall, music therapy could be a necessary support for any memory-related goals given the research in the area of music mnemonics to assist with memorization. 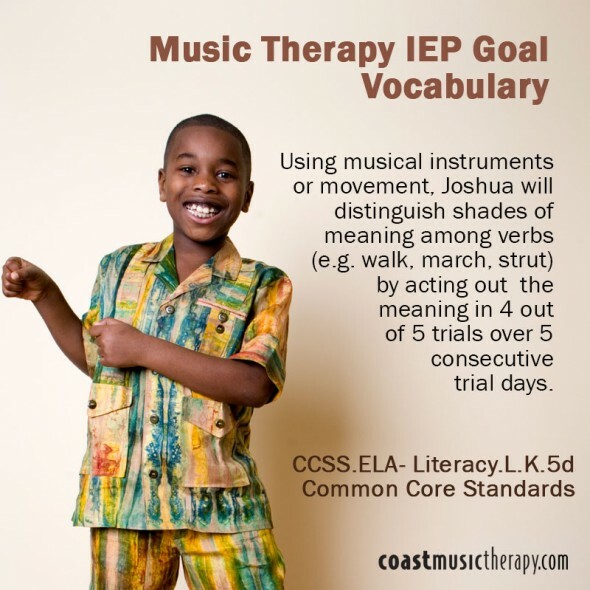 Because IEP goals often align with Common Core State Standards (CCSS), the music therapist should also be familiar with the CCSS and prepared to determine how evidence-based music therapy interventions such as Neurologic Music Therapy techniques could potentially support IEP goals relating to the Common Core Standards. How is Music Therapy Embedded within an IEP Goal? Often times, music may be the ‘condition’ or ‘prompt’ within a short-term IEP objective. The annual goal may then require the student to perform the same task without music being used in order to demonstrate generalization. Although in the private music therapy setting, the music therapist may teach the student musical skills such as playing an instrument, a goal to learn music would not typically be added to a student’s IEP. However, a music therapist may be a collaborative support to a social skills or behavior goal that relates to the student’s participation in inclusion settings such as band or choir class. In this setting, the music therapist could assist in giving adaptations and accommodations in order for the student to learn alongside general education peers. Here are a variety of sample IEP objectives written by Director Michelle Lazar, MA, MT-BC, Autism Specialist and Board Certified Music Therapist. Given a song lyric with the last word left out, Sebastian will produce an intelligible one-word utterance to complete the song phrase with 80% accuracy in 4 out of 5 trial days. Given prior rehearsal with music mnemonics, Raymond will recite the remainder of a spelling rule from memory (such as “I before E except after C”) when cued by staff with the first two words with 90% accuracy in 4 out of 5 trials. After a song story is sung to her, Sydney will answer “Who” and “What” questions about the story, with 80% accuracy in 4 out of 5 trials. Given a melody that ascends and descends with a steady beat, Michael will role play pulling pants up and down in time with the music in 8 out of 10 trials over 3 consecutive trial days. After hearing a “Rules of Conversation” song, Jayden will recall and role play four conversation rules (such as waiting turn, making eye contact, etc.) with 75% accuracy in 4 out of 5 trials. Using musical instruments or movement, Joshua will distinguish shades of meaning among verbs (e.g. walk, march, strut) by acting out the meaning in 4 out of 5 trials over 5 consecutive trial days. Given melodic and/or rhythmic prompts, Caroline will correctly recite her phone number from memory with 100% accuracy in 4 out of 5 trials. NOTE: Annual goal would be without melodic/rhythmic prompts. After listening to a song story book, Max will sequence the beginning, middle, and end given picture choices, with 80% accuracy in 4 out of 5 trials. 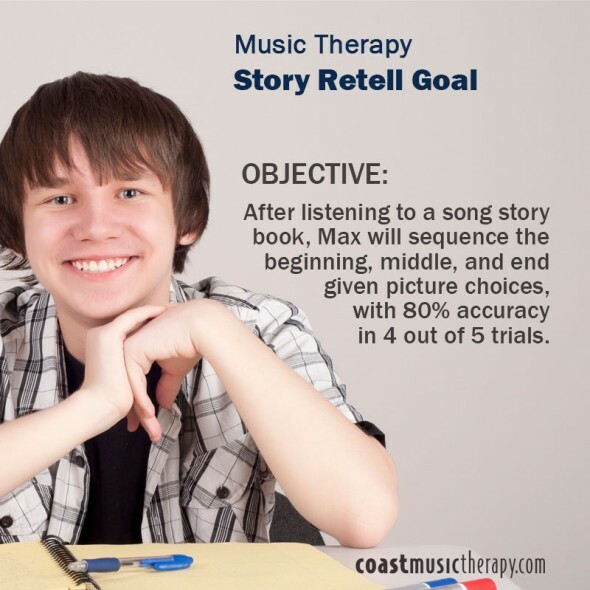 View more goal areas music therapists support and listen to songs that target common objectives on our Music Therapy Goals page.